Robitussin & Dimetapp are $3.99 this week (make sure that you get the bottles that are marked at this price because they are the only ones that work for this deal). There are $3 printable coupons for the Robitussin and $2 printable coupons for the Dimetapp (links below). 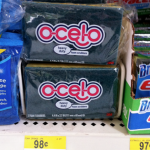 2 Oust Sanitizers – they are on sale for $2.99 this week and there is a $1/1 Walgreens coupon in the Easysaver catalog and a BOGO free coupon that was in the paper recently as well as a $1/1 coupon that was in the paper recently. They let me use all 3, which made them free. Glade Fabric Refresher is $2.99. There is a $1/1 Walgreens coupon in the Easysaver catalog and there were $1.50/1 coupons in the paper recently (or printable ones on their website). This makes it .49! There is a manufacturer’s mail in rebate for the Action Scrubbers. You will be reimbursed for the full purchase amount $3.79. You CAN get paid to shop! 🙂 Happy shopping! 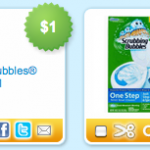 New Scrubbing Bubbles coupons + Walmart and Walgreens deals! 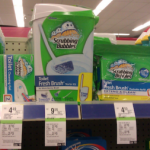 Nivea and Scrubbing Bubbles MONEYMAKERS at Walgreens! Colgate Toothpaste MONEYMAKER this week!